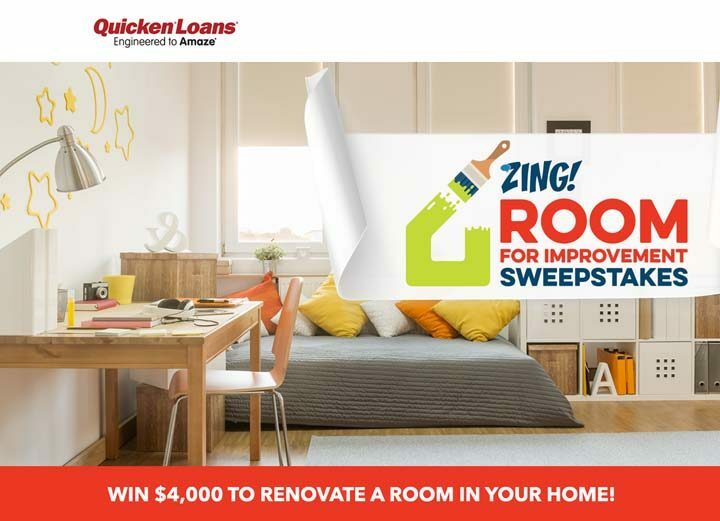 The Zing Room for Improvement Sweepstakes is open to legal residents of the fifty (50) United States and the District of Columbia, who are at least eighteen (18) years of age or older. The Zing Room for Improvement Sweepstakes ends on August 14 at 5:00:00 p.m. ET. Go to the Zing Blog available at quickenloans.com/blog/room-for-improvement-sweepstakes and fill out the entry form. Limit of one (1) Entry per person/email daily. Second Place Prize (2): One (1) Second Place Prize Winner will receive one (1) $250.00 check made payable to the winner, which may be used towards redoing the room of his or her choice. Approximate Retail Value (“ARV”): $250.00. Total ARV of all prizes awarded: $4,500.00.